I purchased this direct from VOAK while at the Oklahoma Vape Jam. Nice folks! I paid less than I have found it for online... at a couple of online shops I am seeing it range between $26 and $30. This is apparently a 60 ml bottle. from USA grown and extracted nicotine, and certified organic VG. Across the bottom of the box, under the window, a line of text reads "luxury lifestyle prestige." The top is blank. On one side, there's a stylized lion in gold, On the other side, there the same lion bracketed by tick marks to indicate nicotine level (this e-liquid is apparently available in 0, 3, 6, and 12). 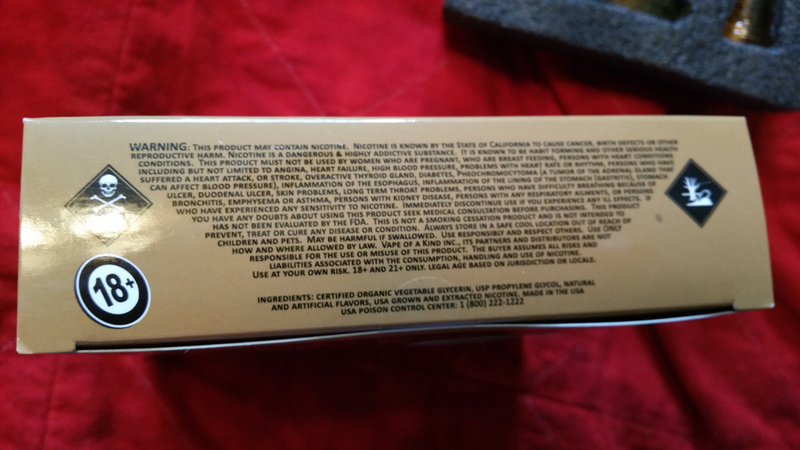 The bottom of the box has enough fine print warnings and disclaimers to satisfy most any lawyer. The back gives a bit of the company story, and the flavor descriptions for the three flavors in the VOAK line (they also have additional lines). 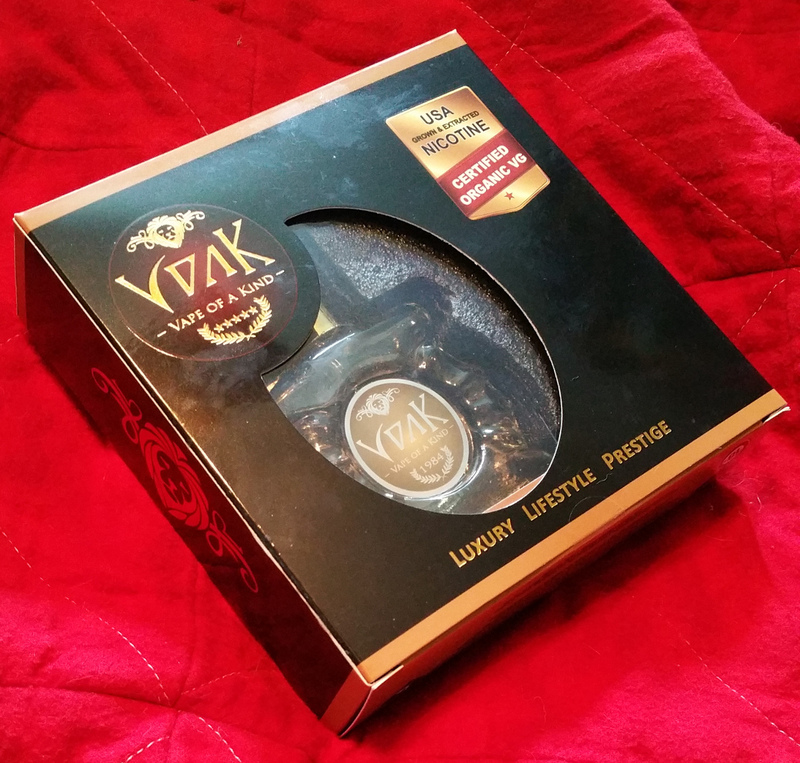 The box opens from the top and the bottle, set in a bed of foam, slides out. To the side, hidden and also embedded in the foam, is a very nice hourglass unicorn bottle. The description of this particular flavor, 1984, is "French tiramisu cake with bourbon drizzle." Quite honestly, simply, they nailed it! The flavor is nothing short of amazing. It is rich, and just coats the mouth... lingers a bit like a rich, dark pastry should. I love, love, love the packaging. In this case, I feel like it's OK to judge a book by the cover. The flavor is rich and saturated. Providing a unicorn bottle along with the fancy glass dripper bottle is a very nice touch. Nowhere on the packaging does it indicate the amount of e-liquid. The online sources say 60 ml. It is a touch spendy. The unicorn bottle is a bit tough to operate as it is hard plastic with a softer bulb right beneath the cap, and there are no instructions on its operation in or on the box (the owner told me the secret as I made my purchase).